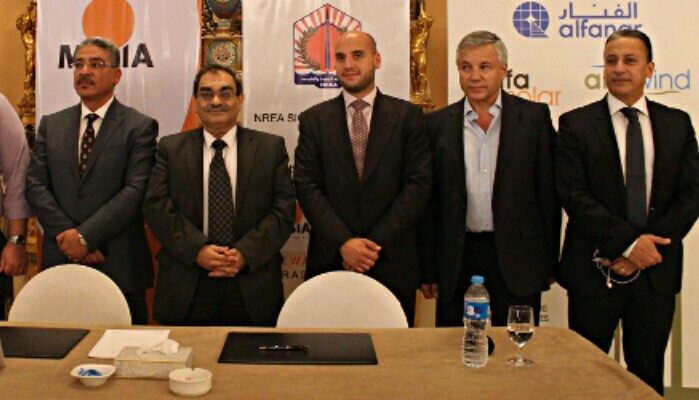 Organized by the Middle East Solar Industry Association in partnership with the Ministry of Electricity and Renewable Energy, a two-day renewable energy forum was recently hosted in Cairo, Egypt. Bringing together over 150 government policymakers, investors, and project developers, progress and developments in Egypt’s solar and wind market were presented, and many fruitful roundtable discussions and deal-signing sessions took place. Held at the historic Marriott Palace Hotel under the patronage of Egyptian Prime Minister Ibrahim Mehleb, other top officials in attendance included Mohamed Shaker, Minister of Electricity and Renewable Energy; Mr. Hassan Fahmi, Chairman, Egyptian General Authority for Investment (GAFI); and Dr. Mohamed El Sobki, Executive Chairman of the New and Renewable Energy Authority (NREA). The roundtable sessions during the MESIA Renewable Energy forum were offered to connect local Egyptian industry firms with international solar companies, manufacturers, and investors. Project financing options and grid upgrade requirements were also topics of discussion. The aim was to encourage coalition building between MESIA members and local renewable energy companies interested in expanding in the quickly growing wind and solar manufacturing and energy production sectors. The MESIA Renewable Energy forum was very successful, with Egypt’s Ministry of Electricity and Renewable Energy signing 7 binding memoranda of understanding (MOUs) valued at $500 million. The 7 MOUs were signed with 5 companies from Egypt, Saudi Arabia, and the United Arab Emirates, and included 100 MW of wind and 220 MW of solar projects under the government’s feed-in tariff (FiT) program. All renewable energy projects are located on plots of land pre-approved by the government, with solar projects located at Binban and Aswan, and wind farms on the Suez Gulf in Zafarana. UAE group Access signed MOUs for a 65 MW solar project and a 50 MW wind farm. Egyptian group Orascom Construction (OCI) and Saudi company Alfanar have both signed MOUs for 50 MW solar installations and 50 MW wind farms. Egyptian firm Sun Infinite will build a 50 MW solar project, and Egyptian Gila Al Tawakol Electrical will build a 20 MW solar project. These new deals follow closely on the heels of Egypt’s Economic Development Conference in March during which 4 similar solar MOUs were signed, including major deals with Canadian solar giant SkyPower Global and Saudi Arabia’s FAS Energy. Held in partnership with Access Power MEA, the MESIA Renewable Energy forum was made possible through the additional support of Alfanar, Bracewell & Giuliani, Infinity Solar, Chadbourne, Corys Environment, Eversheds, First Solar, Huawei, and SunEdison. “Egypt’s electricity demand is growing at one of the fastest rates in the world and the government’s clear commitment to the development of renewable energy, through the creation of bankable policy frameworks and the support of the MESIA Trade Mission, has the potential to create one of the world’s largest renewable energy markets,” said Fotuhi.